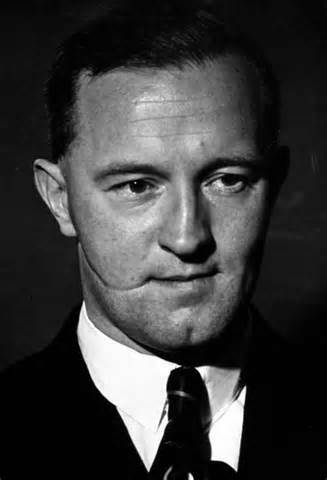 In September, 2015, I blogged about William Joyce (1906-1946), otherwise known by his critics as ‘Lord Haw-Haw’, who broadcast for the Germans during World War Two, and was executed as a traitor shortly after the War. At that point I looked forward to a new biography of Joyce by Professor Colin Holmes, Searching for Lord Haw-Haw. This has now been published (it appeared in August), and it will surely become the definitive biography of this highly controversial fascist. It is certainly rich in detail and new revelations. Interestingly, among the many facts contained within the new book, is a brief reference to William Joyce’s visit to Chiswick. By sheer coincidence, I have just been conducting some research of my own on local fascism in Brentford and Chiswick, and can provide a bit more background detail on Chiswick’s encounter with both Joyce and fascism. After a brief flirtation with the ‘British Fascisti’ in the early 1920s (during which time he had received a razor slash across his face while protecting a meeting), Joyce had joined the new ‘British Union of Fascists’ (BUF) shortly after it was founded by Sir Oswald Mosley in 1932. Joyce soon became one of the BUF’s star speakers, and quickly developed a reputation for rabble-rousing speeches, highly anti-Semitic in nature. He specialised in passionate oratory, and helped Mosley’s movement develop a sophisticated propaganda machine, with training classes for all BUF speakers, and a huge emphasis on getting the BUF’s ideological message across on posters, in leaflets, in newspapers, and via almost-nightly speeches made at meetings up and down the country. In March, 1934, one such BUF meeting was held on a Monday evening at Chiswick Town Hall. Joyce – or the ‘Professor’ as he was known by his keen BUF supporters – delivered a long speech to a crowded hall, at what the local press said ‘must have been one of the most orderly meetings’ of the BUF’s ‘lively career’ up to that point. Another local newspaper columnist also commented afterwards on the large and ‘extremely orderly audience’, and reflected: ‘I think that Mr. William Joyce was preaching largely to the converted – judging by the complete absence of interruptions. Or perhaps it may be that the would-be humourists were subdued by a healthy respect for the hearty-looking youths in black shirts that surrounded the hall’. Joyce spoke for an hour and three-quarters at the ticket-only event in Chiswick and, after a brief interval, returned to the stage to respond to questions from the audience for another hour. During the course of his speech Joyce told his Chiswick Town Hall listeners that fascism could be described as ‘constructive patriotism’, and he claimed that it was ‘the supreme reality of the age in which they lived’. He argued that, whatever the audience thought of Mussolini and Hitler, ‘it must be admitted that they had given their people material benefits’, and this ‘spirit of philosophical regeneration’ must come to Britain. He said the BUF would not disassociate themselves from ‘two of the greatest men in Europe’. The only alternative system to the present one, Joyce claimed, was ‘a Fascist dictatorship’, but based on the ‘will of the people’. In an early sign of his racist views, Joyce also alleged that ‘large numbers of Jews’ were coming into the country and were taking jobs meant for British citizens. The BUF must have been quietly satisfied with their Chiswick meeting as, just weeks later (in April, 1934), the movement founded a Brentford and Chiswick branch, and opened a local HQ at 98, High Street, Brentford. But things then went relatively quiet, and the BUF evidently struggled to recruit sufficient numbers of members in the locality. However, in the late 1930s, the movement appears to have revived in the area. BUF activities included another meeting at Chiswick Town Hall, held in February, 1938, this time with A.K. Chesterton (cousin of G.K.) as the speaker. In July of the same year, Chiswick also received a visit from the BUF leader himself, Sir Oswald Mosley, who held an open-air mass rally and parade in the main High Street. It was estimated that 300 police constables were on standby, in case of trouble. Mosley spoke from the top of a van, with the aid of two microphones, to what a local newspaper called an ‘orderly crowd’. In March, 1939, Mosley also spoke again in Chiswick, to what was described as a ‘packed hall’ at Chiswick Town Hall, his main message being the need to avoid war between England and Nazi Germany. But war clouds were gathering on the horizon, and the residents of Chiswick had already been busy building air raid shelters and reading alarming headlines about the rise in international tension. What happened to Joyce? In 1937 he departed company with the BUF and formed his own smaller ‘National Socialist League’. Sensing war was imminent – and fearing possible arrest by the British authorities – he quickly left by boat for Germany in late August, 1939, accompanied by his equally pro-Nazi wife, Margaret. When they reached Germany, the pair offered their services to the National Socialist regime, and William Joyce was given a job as a broadcaster on Germany Calling, a propaganda programme on a radio station run by the ‘Reich Ministry of Enlightenment and Propaganda’. This Ministry was a key arm of the Hitler dictatorship, and was headed by Dr. Joseph Goebbels. In September, 1939, a Daily Express journalist in this country coined the nickname ‘Lord Haw-Haw’ in order to describe all the broadcasters in English ‘of the haw-haw, dammit-get-out-of-my-way variety’. The top-hatted figure in the image here is from a British postcard issued in 1942. Ironically, Joyce really liked the term ‘Lord Haw-Haw’ and soon appropriated it for himself, and the nickname became very much associated with Joyce for the rest of the War. As I noted before in my previous blog on Joyce, despite all the energy that the Nazi regime poured into its English-language propaganda during the War, most scholars on the subject seem to agree that the impact of Joyce and other broadcasters on British morale during the conflict was very limited. Although some officials in the British government were at times very concerned about these broadcasts, the evidence suggests that hardly anybody in Britain believed a word Joyce said. At the risk of stereotyping about aspects of the national character, one of the best weapons against the Nazis was, arguably, good old-fashioned British scepticism, combined with a sense of humour! 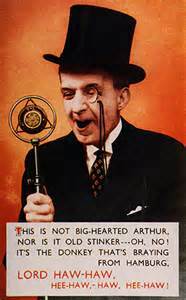 The majority of people in this country, and probably in Chiswick too, appear to have tuned into the broadcasts by ‘Lord Haw-Haw’ more for entertainment value, as the BBC’s own broadcasting services at the time were viewed as rather dry and boring. This entry was posted in British history, European History, Fascism, German History, Local History, Media history, Public History, Teaching and tagged British history, civic engagement, history, Local History, Public History, World War Two, WWII. Bookmark the permalink.